In 2008, the number of smart devices (things) connected to the internet exceeded the number of people on the earth. In 2020, Cisco and several other organizations estimate there will be 50 billion internet connected devices. Many of these devices will report to central servers and databases, while other devices may communicate directly with each other and develop their own intelligence. Most of these Internet of Things devices will be extraordinarily small and in many cased unseen. There are many new microcontroller, wireless and sensor technologies that enable these small Internet of Things devices. Rechargeable battery using ambient energy harvesting that lasts the life of the product. Recent advances in ambient energy transducers, rechargeable solid state batteries and high efficiency power conversion electronics are making Energy Harvesting-based power solutions cost effective, especially when the life cycle costs of changing batteries are taken into account. Imagine a world where everything is smart and connected. A world where every product – from washing machines to light switches, pacemakers to hospital gowns, wristwatches to running shoes – can provide useful data that make our lives better and easier… Where thousands of wireless sensors networks help optimize crop planting and irrigation, monitor avalanche and forest fire conditions, regulate city water systems and automobile traffic… That’s the world of the Internet of Everything (IoE). And it’s coming faster than most people think. The driving technologies – ultra-low-power processors, tiny mobile sensors and wireless networking – are all available today. Industry leaders like Intel, Hewlett-Packard, Qualcomm, Bosch and Texas Instruments predict mobile sensor demand will rise from billions/year today to trillions/year by 2025. 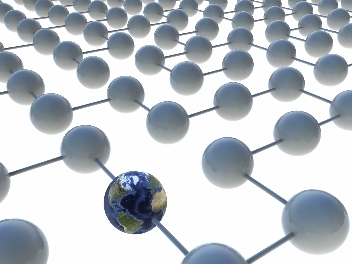 And according to Cisco, IoE growth will generate $14.4 trillion in value – across every industry – over the next decade. Much of the first wave of this growth will be in wearable technology. From Google Glass and iWatch to fitness bands and patient vital sign monitors, the body area networks these devices will inhabit present fewer development obstacles and lower infrastructure costs than larger networks. Credit Suisse expects the total market value in wearables to increase ten-fold – from $3-5 billion to $30-50 billion – over the next three to five years. But for this growth to happen, new power solutions will be required: power solutions that are small, thin, self-recharging, and never need replacement. Conventional batteries simply won’t meet the requirements for most of these new products. Fortunately, a highly efficient and effective alternative now exists: rechargeable solid state batteries combined with ambient energy harvesting or wireless charging. 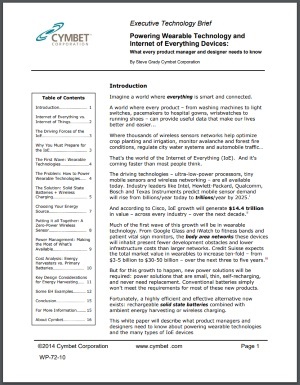 This white paper will describe what product managers and designers need to know about powering wearable technologies and the many types of IoE devices.click here.